The large window niche brings dazzling light into the multicolored, multitextured room furnished largely with pieces from Roche Bobois. The elegant fireplace provides a sedate backdrop to colorful artwork and wallpaper as well as whimsical flower arrangements on the mantel. The painting is by John Schueler. The designer calls the black wing chair fitted with dyed turkey feathers on the back a tour de force. The glass-topped desk, which can be extended to the size of a dining table, is a neutral centerpiece amid the variety of colors, textures and patterns in this corner of the room. The French fauteuil behind the desk is a traditional counterpoint to the swan bergère opposite. Traditionally paneled walls set the stage for non-traditional furnishings and sculptures. Modern red chairs surround the table next to the bar. The bar is topped by a 17th-century carved medallion from Italy. 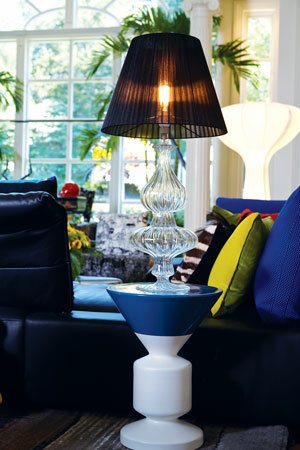 A three-tiered lamp tops a three-tiered table—different shapes, similar proportions. 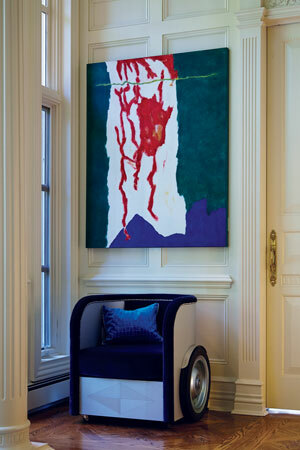 In a corner of the room, a Ben Hur-style chair sits beneath an abstract painting by Theodoros Stamos. 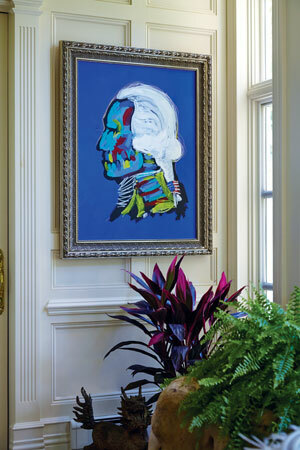 A colorful portrait of George Washington by Bradley Theodore hangs in another corner of the room. A formerly formal room gets a bold makeover. “I call it Paris Avant Garde meets Saddle River Traditional,” Barbara Ostrom says of the room she created for the 2015 Designer Showhouse of New Jersey in Saddle River. Though she collaborated with the builder 25 years ago to design this traditional home, she departed from tradition this time around and created a family room in the home’s former living room. Ostrom wanted to take her design in a more casual direction and turn the once-formal room into a livelier space. Pairing a conventional foundation with eclectic décor requires finesse. Ostrom turned to Pierre Berardo, general manager of Roche Bobois, a Paris-based home furnishings company with showrooms around the world, including a brand-new one in Paramus, to assist in selecting pieces for the room. “I wanted something fun and amusing,” Ostrom says. Berardo accommodated that request with a selection of pieces inspired by pop culture, nature and everything in between. Case in point: the room features two opaque, bulbous floor lamps called “Arbre” lights. They’re stylized versions of “trees in your room, with big flowers on top,” Berardo says. The wheeled chair in a corner next to the window bears a close resemblance to its inspiration. “The Ben Hur chair was inspired by gladiator films and designed by Jean Paul Gaultier,” Berardo says of the chariot-shaped seat. The juxtaposition of traditional and outré in this space gives the room an exciting vibrancy. In the grand window alcove sits a sleek, glass-topped desk, which is really “a dining table inspired by an astrolabe,” Berardo says. Situated behind this “mechanical” piece—which features visible gears—is a proper French fauteuil chair, finished in goldleaf and upholstered with velvet fabric. On the other side of the desk, Ostrom turned tradition on its side with a swan bergère chair. The chair’s genteel Louis XV silhouette gets a playful interpretation with the addition of “feathers” on the back. “We tried to pick up serious and mix it with whimsy,” Ostrom notes. That philosophy extends to the floral arrangements. “On either side of the fireplace are topiaries with ladies’ hats made of flowers and feathers.” The resulting arrangements bring a peacock-like elegance to the mantel. The whole family will be enticed also by the profusion of tints throughout the space. The audacious use of color, displayed to dramatic effect in the natural light from the wall-sized window, plays a major role in creating an exuberant atmosphere. “This time around I wanted to do it as a fun family room with beautiful bright colors—a place that everyone would want to come into,” Ostrom says. The bold colors are key to the design, holding their own against the room’s large scale, whereas a paler palette might get lost in the imposing architecture. “We used French designer colors,” she says. The bright reds, vivid blues and intense yellows bring a playfulness that’s accentuated by the room’s traditional bones. Marirose Krall, a regular contributor to Design NJ, is a Red Bank-based writer. Proceeds from the 2015 Designer Showhouse of New Jersey in Saddle River benefited the Center for Behavioral Health and Medicine at Hackensack University Medical Center. hackensackumcfoundation.org. 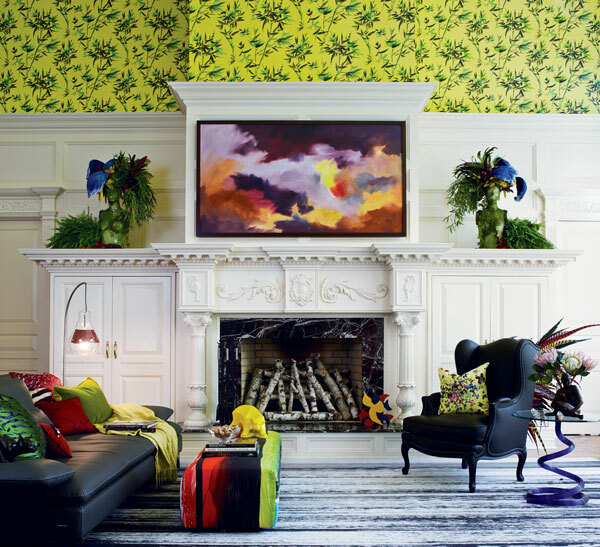 Overall: Designer, Barbara Ostrom Associates in Mahwah; furnishings and lighting, Roche Bobois in Paramus, New York City and Philadelphia; 17th-century Italian carving over the bar features a white goldleaf finish by Andrew Tedesco in New York City; Christian LaCroix wall covering and pillow fabric, Osborne and Little, New York City; all artwork and sculptures, ACA Galleries in New York City; zebra rugs, the designer’s personal collection; floral design, The Raimondi Group Inc. in Ho-Ho-Kus.